My turn 2 was thalia, his turn 2 was bob. My turn 3 was attack with Thalia, wasteland his land, and play stoneforge for fire and ice. So, on his 3rd turn, he attacked with bob, I could have traded with stoneforge, or not. I did. I dont think it was a good play, but I cant say anything for him, didnt know the contents of his hand or his game plan. Maybe he was expecting batterskull and thought it couldnt race agains it. It's my opinion from my perspective of the match. Maybe there's a list where the two can me combined, and I think it would work. But only as a 1 or 2-off (ballista). The reason is that we are, in fact, a aether vial deck, and ballista is not that great without lots of sol-lands. In theory, as you said, is great, but I think it is too slow. Maybe a differente list with tue full 4 orzhov + ballista would be something to consider. About big thalia: Too slow. Bad topdeck. Lot of people tested, it has never been great. If the cards is playable, its in a sol-land/chrome mox/lotus petal build. I think it sees play in the soldier stompy deck. Last edited by kioken; 03-29-2019 at 08:11 AM. Not anymore. Serra Avenger is a good card, but I think this build with 4x Orzhov for beaters is better. The evasion of Serra Avenger is great, and it has a decente body, playing both ofense and defense. But the casting cost is complicated, without vial it only enters on turn 4, and is WW, which I dont like much. I want consistency, and avenger doesnt provide that. But I would never rule it out, its a card that can, at any moment, return to the deck. Or was it you Kioken? It was me. After I started using 4x Orzhov (I tested with 1 and 2 a few times) I made: second, first and first of the three consecutive tournaments I faced. (currently 15-1-1 total I guess) It was the same time I take out the batterskull from the deck and started using 2 council MD. Is someone else using the card? How are the tests going? I have a friend that test 1 or 2-off on MOL and said the card was very good when he drew it. But i'm going to Paris next week and will probably attend a legacy tournament. 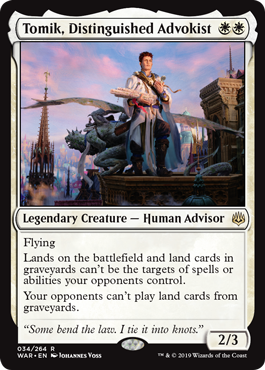 Can't be tutored by white recruiter and the WW cost is a little tough, but 2 mana for a 2/3 flier that we can save with Karakas, stops opposing ports/wastelands, and most of the shenanigans from lands. Not sure it makes the cut, but it's an interesting creature at a good rate that has a lot of potentially relevant text. Tomik is an interesting card, to be sure. My suspicion is that it does not currently have a place in this deck. A 2/3 for 2 that flies with no drawbacks is about as good as anyone could ask for in terms of efficiency. But unless the Loam engine or something similar earns a steady spot on the DtB list, I certainly will not be packing this fellow. Even the cantrip shell decks that pack Wastelands rarely actually try to take out our lands with those Wastelands. Damn, why could it not have said "Lands can't enter the battlefield from graveyards or libraries."? THAT would be a card. Tomik prevents Vampire Hexmage and Thespian's Stage from targeting Dark Depths, right? Interestingly, I wanted to make a nasty stupid deck with Tomik, Port, and Kudzu, but it does not target. Poopie. Ha ha, I had exactly the same idea, but we both failed due to Kudzu's wording. -Human if you play Cavern. -Can be saved by Karakas. -Hoses a few combo decks, like lands, loam, enchantress and depths. -Can save a land from wasteland/port or a manland from removal. -Prevents pumping of Inkmoth Nexus. -Can be bounced by opposing Karakas. To be honest, it seems overall better than avenger to me. Tomik seems very good. WW for a 2/3 flyer is pretty solid as is, being legendary is actually beneficial for you with Karakas, and it's ability is very good against several common matchups. At the very least, I'd say it deserves at least one copy in the 75. I think it's interesting... but do we really need help against Loam Decks and Depths? Our maindeck is pretty well equipped to beat those decks, It doesn't do a lot in the mirror because of opposing Karakas. I'm definitely going to pick up a set but probably only a meta toolbox kind of guy. We are going to have to talk about Dovin. It looks to me like a serious candidate for maindeckedness. In fact, given how hard it will be to kill in DnT with all of our creatures, I might even consider three of them. We can even Flicker him to get him to full loyalty after a few activations. The challenge is that he would cost 4 with a Thalia in play, and cannot be cast off of AEther Vial. Is that really any better than Vryn Wingmare?